The Boston Lykeion Ellinidon’s Traditional Music Department offers opportunities to learn about and enjoy Hellenic musical culture, from instruction and workshops to concerts and performances. The department is chaired by Sandy Theodorou, a vocalist, accordionist, and laouto player who specializes in traditional Greek regional music and Greek urban rebetika. In 2018, the department will launch the inaugural Boston Lykeion Ellinidon Participatory Courses in Greek Traditional Music, with the support of Dr. Pantel Vokonas and the Maliotis Cultural Center. Participants will learn about traditional Greek music from master level instructors in six weekly two-hour sessions. Courses will include lectures by the instructors and a participatory segment in which students may choose to play or sing sample selections representative of the theme of the course. 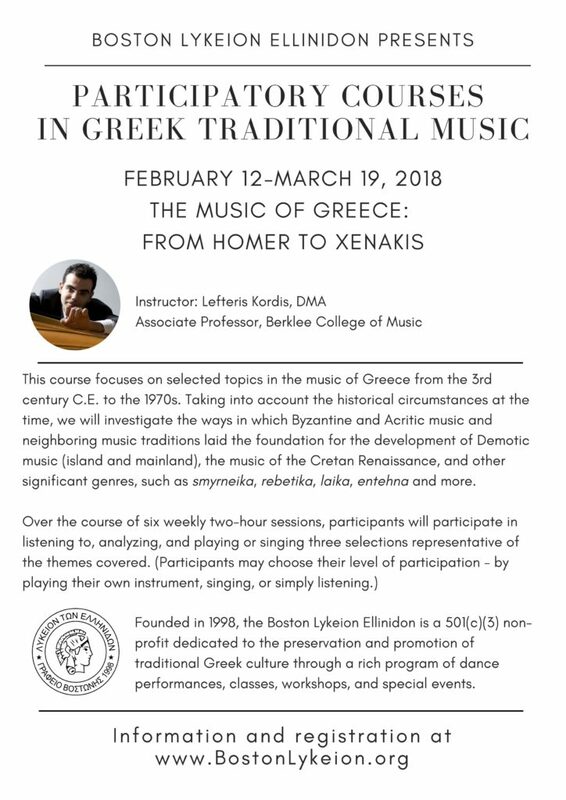 The first course, The Music of Greece: From Homer to Xenakis, will be taught by Lefteris Kordis, DMA, associate professor at Berklee College of Music and begins on February 12th, 2018. For more information and to register, visit the Traditional Music Department page.